I am so chuffed ... I donated this pair of handmade earrings to the Craft Hope for Haiti etsy shop and they have sold! I feel as though I have helped in a teeny tiny way. The proceeds go to Doctors Without Borders in Haiti. Chance to mention too the selfless crafty ladies who must have a mammoth task in organising the whole thing. There are some simply gorgeous handmade items in the shop; do go and have a browse (don't forget to take your purse)! 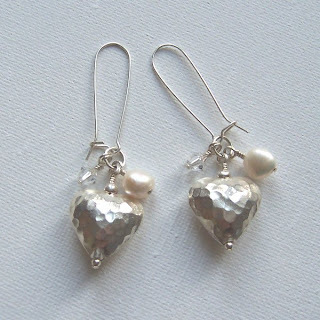 I indulged in a bit of 'jools' at the weekend (for future reference, that's how I fondly refer to making jewellery) and have continued fiddling about (that however is a strictly technical term) with my website http://www.mypinkcow.co.uk/. I am a 'self-taught techie' and designed and created my website all by myself (chest puffs out a little with pride) using Microsoft FrontPage. The tools of my trade are a constant supply of strong and steaming coffee and full concentration. If per chance my sense of logic has temporarily done a runner then I steer clear. This is my 'Anything For You' necklace which is one of my current favourites. 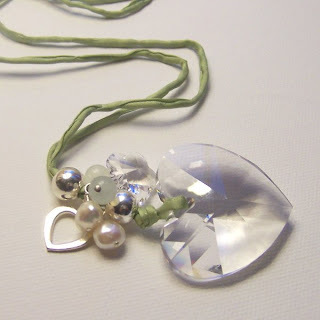 It's a huge 4cm swarovski crystal heart and cluster which is strung on silk and is currently available in green and brown. I sold my pink one but shall definitely be making another. I've made a green one for myself too (creator's perk!) and I like to wear it long (just above my tummy button). 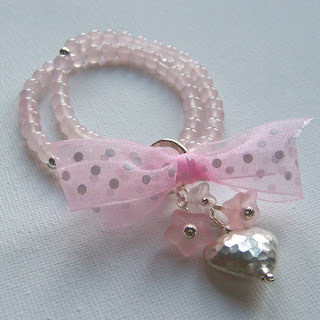 This is my Angels' Delight elasticated rose quartz bracelet. It's pretty, girly and pink just because. These are my 'Such Charming' earrings. 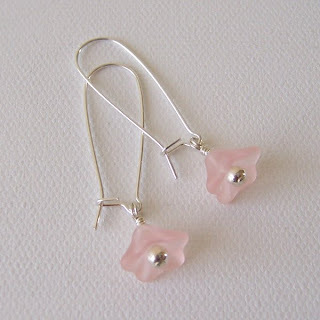 I'm into long earrings at the moment and always love anything that tinkles prettily. These are my most favouritest shoes in the whole wide world. They're by Neet. 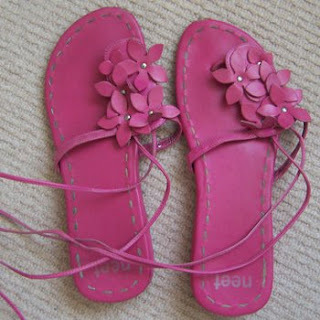 If you ever come across them on your travels, in any colour, in a size 5, pleeeeeeeaaaaaaaaasssssssssse let me know. Next summer will be their fifth and I'm worried they'll fall apart like their sister pair (I miss you matching aubergine shoes). I shall simply never go out again if they do. :-( ! How come I haven't commented yet? I promise if I ever see those shoes I'll buy lots of pairs for you...I spend my summers in George 2.50 flip flops...thanks for your comments to cheer me up, January isn't usually so eventfull for me but with brother-in-law visiting from Australia and this Ruby Anniversary Party I'm snowed under with stuff. Why did I volunteer to bake a two tier cake I've never made in my puff before? Why with two sons is me, the only daughter-in-law doing all the buying etc to decorate the hall....I'm such a moany-face!! I should be sleeping but feel the need to linger on intersweb...take care.